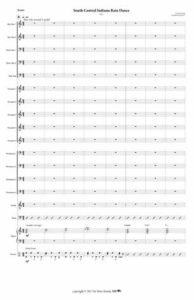 I finally finished my most ambitious and complex big band arrangement so far. The two words “ambitious” and “complex” can only mean one thing: this contraption will probably never get played. But then, who knows. My friend Brent Wallarab, who directs the IU Jazz Ensemble, played two of my earlier pieces this past season and both of these were somewhat “ambitious” and “complex”. This one has a long history of revisions and false starts. It started out as a sketch in 15/8 meter, received a “B” section (that’s the sing-along part) and the epic six bar solo vamp based on Bm11, C#m9 and Dmmaj7 which made it’s earliest appearance in a piece for 7 string classical guitar called “Trail Mix”. It was written early 2012 for “Splinter Group” and played live once or twice, but nobody really knew what do to with it – least of all I. After I had my first successful encounter with big band arranging via my German friend Lothar Landenberger in 2014, “South Central Indiana Rain Dance” seemed like a worthwhile and rewarding big band candidate. I started with way too many chords and wrote myself into a corner. For testing drum grooves and flow I had done a little recording with guitar and sequencer. I liked the tribal nature of the tune, but just wasn’t able to translate it into big band sounds. Then, as so often, other stuff came up and the project slipped towards the bottom of the to-do stack. After my first big band arranging experience in 2014, when I arranged a full concert’s worth of my fusion originals plus some Pink Floyd and The Police material, I thought I was done arranging. While the concert in October of 2014 was a great success and I really enjoyed my two days of fame as frontman, composer and arranger of almost all of the music, after I came back to Indiana it was an anti-climax. My friend Lothar, who had talked me into doing the arrangements in the first place, started bugging me again a few months after I was back home in Indiana. Somehow I didn’t feel it and I didn’t hear from my friend in a long while. Then, in January this year (2017) Brent Wallarab emailed about my arrangements. Brent is one top notch writer and arranger who (unlike me) knows how to do this stuff. He was interested in some interesting big band music for his Indiana University Jazz Ensemble – and they would even pay for the charts. He ended up picking two, “Bajao do Banana”, which had been played at the Tuebingen Jazz & Klassik Tage 2014, and “Alice’s Cool B***s” which is a piece that was originally recorded on “The Rise of Kwyjibo” and then got a big band treatment to become the grand finale of the show. But it never got performed because we ran out of time. 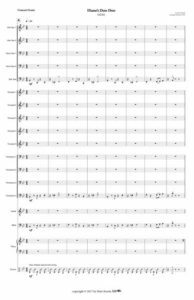 After Brent expressed his interest in my amateurish big band efforts, a new enthusiasm awakened and I thought I’d expand another of the tunes from “Peter’s Money”. “Diane’s Doo-Doo” was the pick.